The greater sage-grouse’s annual mating dance on leks, or breeding grounds, is a one-of-a-kind spectacle that draws bird watchers from around the world to the Western U.S. The male sage-grouse fan out their spiky tail feathers, puff up their chests, and strut around while the females wait to be impressed. Year after year, the sage-grouse return to the same sites amid the sagebrush to carry out the ritual that keeps their species going. Far less useful is a dance that is turning into an annual ritual in Washington. For two years in a row, the House of Representatives has added a provision to the National Defense Authorization Act that would derail plans long in the works to conserve the greater sage-grouse. The Senate will write and vote on its version of the bill and could end up including the sage-grouse language. Last year, senators rejected the provision. Take ActionSpeak out now and don’t let Congress add anti-environment provisions to the National Defense Authorization Act. Unlike the bird’s ceremonial dance, the congressional sage-grouse shuffle serves no constructive purpose. The provision’s proponents say the language blocking federal efforts to conserve sage-grouse is needed to avoid hindering military operations and training in the bird’s habitat. But this is not the case – defense officials have said they don’t anticipate problems and could get exemptions for national security reasons anyway. The political dance in D.C. might be just another round in the fight by some politicians to wrest public-lands management from federal agencies, but it’s a potential disaster for a struggling wildlife species. Greater sage-grouse once numbered in the millions in the West. The current population is estimated at 200,000 – 500,000 across 11 states. 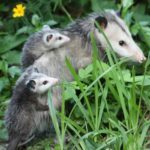 A big reason for the decline is loss of habitat due to drought, wildfires, oil and gas drilling, invasive species, livestock grazing, urbanization and conversion of sagebrush steppe to agricultural land. The Bureau of Land Management and U.S. Forest Service have conservation plans, developed with input from a broad array of interests and tailored to individual states, aimed at conserving sage-grouse and its habitat. Based on work by state and local governments, private landowners and others and the safeguards in the federal plans, the U.S. Fish and Wildlife Service was able to avoid the need to place the bird on the Endangered Species List. The provision in the National Defense Authorization Act jeopardizes years of work, survival of the greater sage-grouse and the health of more than 350 other species that depend on the sagebrush steppe. Mule deer, pronghorn, elk, bighorn sheep, golden eagles and migrating songbirds are just some of the wildlife that share the sage-grouse’s habitat. 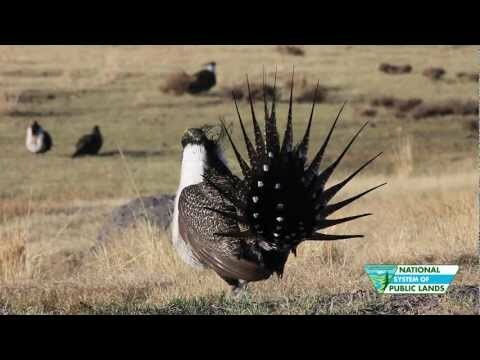 Concern for the sage-grouse, other wildlife, and recreational activities such as hunting, fishing, hiking, and bird-watching that take place in sagebrush country has led people across the West to rally for the bird. The sage-grouse provision would block the roll-out of the national conservation plans and prevent the Fish and Wildlife Service from making any decisions on the bird’s status for ten years. Meanwhile, greater sage-grouse continue their rituals in the remaining sagebrush lands. In early spring, the birds will once again gather on the communal mating grounds. The males will spread their pointy tail feathers and thrust out their chests as they prance around, challenging other males by making burbling and popping noises that sound like a loudly percolating coffee pot. Video from the Bureau of Land Management in California.